Perfect for late morning brunches or mid-afternoon bites, sweet crepes are a delight you won't want to miss.In this recipe, the soft, thin shell is filled with sweet hazenut nutella, juicy strawberries, and flavorful bananas. 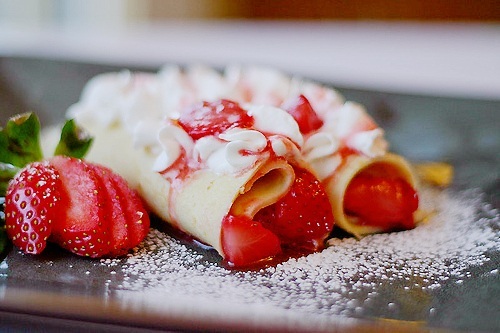 These crepes will definitely leave you with a lingering taste of delight! Optional: Vanilla ice cream, powdered sugar, whipped cream. Wash and cut off the stems of the strawberries. Cut the strawberries into halves. Peel and slice the bananas. Lightly oil a pan or griddle. Pour a dollop of batter onto the pan/griddle, then tilt the pan in a circular motion to cover the surface of the pan/griddle with the batter. Cook the crepe until the bottom is light brown, then use a spatula to flip it over. Cook for another thirty seconds to a minute, then scoop onto a fresh plate. Spread a generous serving of Nutella onto the crepe, then top half of it with strawberries and bananas. Fold the crepe in half, and add optional ice cream, powdered sugar, or whipped cream. Enjoy!